Can you stand long months without a sun, with the temperature dipping below minus 30, with every vista out there laminated by an unnatural sheen thrown in by auroras, those fluorescent solar waves peculiar to polar skies, followed by long months without any hope of a pitch dark night when we could slough off our worries and bitterness gathered over a day, leap into cozy beds, and gravitate slowly down into the cushy bosom of slumber? In short, can you live in Finland? How could you sleep when a bleak sun that hangs never-endingly on the horizon like an annoying grandfather clock, tries to pry open your eyelids with its cold yellow fingers (S.A.D, Seasonal Affective Disorder may not affect the native Finns much, but many travelers to the Nordic country plummet into the dark bed of depression without getting much sleep) all through a month! No wonder the Finns call their Summer, white nights! No wonder they kindle their sleepless nights with a little more high-octane drink than us, to pep their spirits up. Catch Finland in a Summer weekend when she chills out at her home or out in a pub. Finns consume slightly over ten liters of pure alcohol per person per year in the form of vodka, beer, schnapps, cidar and other regional varieties to beat that queer sun in the horizon. That’s not steep against the European average. Come winter, the sun vamooses from the corner of the sky, and it would be time for a night that extends for months. Finns now mostly keep themselves to their cozy homes, sipping Kossu, or any other spirit that comes across while singing folk songs or listening to the ones those cold blasts howl outside in the dark. Like its days and nights, Finnish drinking is also a long affair; many believe, bingeing is man’s answer to arctic climate. Once they fortify themselves with spirits, they brave the dark and the weather, and head to the nearest pub in the town. “Kippis!” Cheers to that! 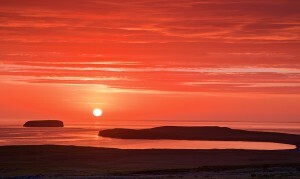 A long evening begins, an evening that would not turn into daybreak for months. A unique blend of barley, the midnight sun process, and the purest water trickling from melting glaciers does the magic, making it one of the most coveted drinks in its genre. Under a sun that refuses to shut its eyes for months, the 6-row barley in Finland ripens in no hurry and feathers out into delicate strands of gold in time. They are harvested, mashed, fermented, distilled continuously until they yield a grain spirit with 96.5% by volume which is then transported (from Kosenkorva distillery in Western Finland) to a place far away, where it is anointed with a special sort of water . Like the grain that mellows for a long day, water used in Finlandia has also got a story to tell, an epic travel story, it is. Elsewhere in distilleries water is filtered and run over ozone and other punishing chemicals to sieve out its impurities. But Finlandia believes it is blasphemy to tamper with the delicate harmony of its liquid it gets from a sleepy village named Rajamaki. Instead, here they revere it. Wonder why? Tell me, how can you make water more pristine, if it trickles down from a place and time as far as a glacial moraine created in the last ice age, 10,000 years ago! They did what pagan worshippers of nature do – maintain an unspoilt forest around the moraine in the village, and keep themselves away. The Brown-Forman Company which owns Finlandia spent millions to get its iconic bottles and publicity campaigns designed in tune with Finnish nature. It was Tapio Wiskkala’s (famous scultor) efforts to capture the quintessence of Nordic land that resulted in the epic de sign of the first bottle. You’d find it difficult to sweep away the image of a melting icicle while holding this bottle high against the sky. 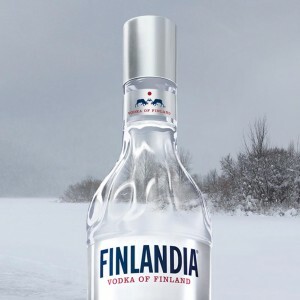 Campaigns – ‘Pure Water’, Vodka from the top of the World,’ ‘1000 years of Less Ordinary Wisdom’ – soon took Finlandia to the top of the pyramid in little time. 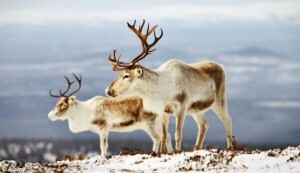 you catch the sun and white reindeer at the same time, you must make a wish and see it granted. Time to hit the bottled icicle. Gently take a sip. Take it neat, roll it with your tongue, slosh it against the walls. Close your eyes so that they can see. Finland’s pristine air, water, untainted soils, the midnight sun, the thousand lakes and islands, glaciers, reindeers and whooper swans, pine trees and birches, swirl up from your mouth, from where the liquid touches the flesh and sparks off a sequence of images, emotions and fantasies. Time to make that wish. (Statutory warning: Alcohol is injurious to health).